Guys have always been accused of dressing poorly unless you're some kind of metrosexual or have had the recent Queer Eye For the Straight Guy makeover. For the rest of us, well it's in our genes. We just dress the way we dress. We get it right some of the time and accept the fact that the rest of the time it just is what it is. But I have to tell you, after seeing some of the coaching wardrobes of late, they are really giving guys a bad name. 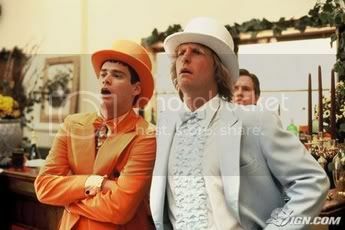 It's like a Dumb and Dumber convention on steroids. How did Mrs. Pearl let Bruce out of the house with this. Did Mrs. Weber? And Maurice "Bo" Ryan....wow. 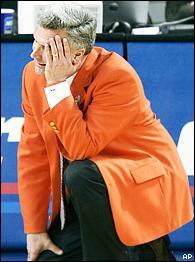 I think a clown convention is looking for it's missing coat....or perhaps Denny Crum had a garage sale. Even the gals have gotten into the act with Pat Summitt's cheerleading ensemble recently. The trend of late has been to take the Crayola box out, pick the most obnoxious color in it and have your tailor craft a clownsuit. I'm all for school spirit. Hell, I love it....but for those of us that wish to keep our retinas attached to our eyeballs, would it be too much to ask to wear an Orange Tie and keep the dinner jacket at home? As much as I would agree that Bo and Bruce look obnoxious in their gaudy suits, I can't help but think about how crazy (in a good way) Marquette's student section would go if Tom Crean were to step onto the court wearing a gold version. He'll never do it, but it would undoubtedly be a hit with the students.